Alderman Sir Roger Gifford was given an Award of Doctor of Science honoris causa by City in 2013. 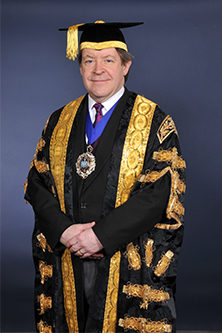 Alderman Sir Roger Gifford was elected as the 685th Lord Mayor of London on 1st October 2012 and took office on 9th November 2012. Sir Roger was born in St Andrews, Scotland and educated at Sedbergh School and Trinity College, Oxford, reading Chemistry. He joined S.G. Warburg & Co in the 1970s and in 1982 he left to join Skandinaviska Enskilda Bank (SEB). For six years he headed the bank's operations in Japan and is now Head of SEB London. He is currently Vice Chairman of the Association of Foreign Banks (Chairman 2007 - 2011). Sir Roger's business interests have centred on raising finance for companies in the London capital markets. He is a member of the Advisory Council of TheCityUK. Roger was elected as Alderman for the Ward of Cordwainer in the City of London in 2004 and is currently on the Policy and Resources Committee of the City of London Corporation. He is a member of the Worshipful Company of Musicians, member and Past Master (2010 - 2011) of the Worshipful Company of International Bankers and a member of the Cordwainers and Security Professionals; he is the sponsoring Alderman for the Guild of Public Relations Practitioners. Sir Roger is also a member of the Cordwainer and Bread Street Ward Clubs, the Royal Society of St George, the Cook Society, the United Wards Club, the City Livery Club and the Royal Perth. He served as Sheriff in 2008/9. Sir Roger's voluntary work reflects his interests in music and education. He is a Trustee of St Paul's Cathedral Foundation, St Paul's Cathedral Choir School Foundation, King Edward's School Witley, the Mansion House Scholarship Scheme and the Mayor of London's Fund for Young Musicians. He chairs the English Chamber Orchestra charity and the Tenebrae Choir among other arts involvements. Sir Roger was made a Knight of the Most Venerable Order of St John (KJStJ) in 2012 and Knight Bachelor in the following year.